A recent Dilbert cartoon had Dilbert speaking to a marketing guy. He says, ‘engineers designed and built every important part of modern civilisation’ and all marketers do is misrepresent it. Naturally, the marketer says you need both, while Dilbert, of course, demurs. Both extremes are false. The product or service has to mean something to those who will buy it. But, while his products were usually in a class of their own, Steve Jobs knew that marketing was critical, and he spent hours getting it right. 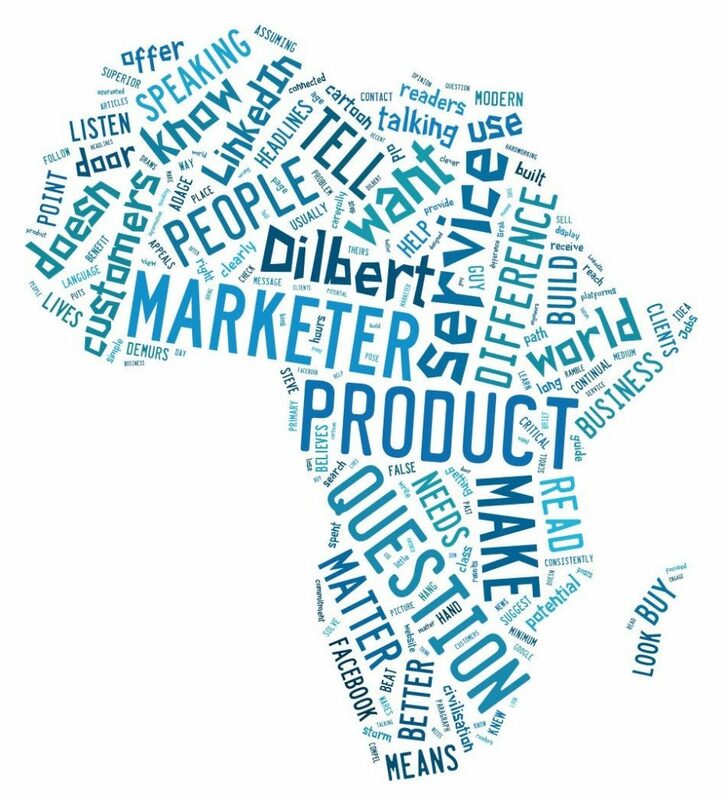 Assuming we have the product or service to take the world by storm, let me suggest four questions to guide our continual search for a better way to reach customers, to inform and to make a difference. You have an idea, a service to offer, a superior product, and you want to tell the world about it. The first question is who do you want to tell? Who are the people who are likely to benefit from your product or service? Who needs to know that you are in business? If you don’t know who you are talking to, you are likely to speak the wrong language to the wrong people. Once you know who they are, where will you find them? Where do they hang out? What do they read and listen to? How do they receive information? What appeals to them? Where are they likely to find you or look for you? Think carefully about where you will place yourself. A website and a LinkedIn and Facebook page seem to be the minimum in this connected age. Even if they are not your primary point of contact, they provide a simple means for anyone to follow up, to check out who you are and to learn a little more without any commitment. Make sure you look at your product from their point of view. It’s not about what you want to sell; it’s about what they want to buy. How will you help them? What problem do you solve? What questions of theirs can you answer? What difference will your product or service make in their lives, in their business, in their customers’ lives? And make sure that whatever platforms you use, wherever you display your wares, you consistently bring the same message. People don’t read. It doesn’t matter how well you write, or what you have to say; it doesn’t matter what medium you use, if you ramble on, you will lose your readers. Grab their attention and make them want to listen. You can use a picture, a headline or a brief paragraph; you can answer a question or pose a question; but whatever you do, it must compel your readers to take the next step, to engage with you and your product and bring them to your door. Think of all the Facebook posts, news headlines, LinkedIn articles and Google results you scroll past every day. Why? What draws you in and what puts you off? Your potential customers will be no different. I read too many LinkedIn bios where people tell me how clever, hardworking and focused they are. Potential clients are much more interested in how we can help them and what we offer than in our opinion of ourselves. How will you engage with your clients in 2015? What will you tell them? Do let us know.